Help the penguin jump and slide on the ice blocks to get fishes and find the exit. Get points and avoid the traps. Use arrow keys. Have fun and defy logic to find the exit to each level. Use arrow keys to move. Keep the A/Shift key pressed to undo. You need to press some switches to unblock doors. Help this miner ninja to collect all gems and stars from the screen. 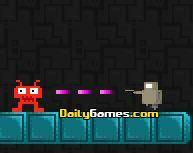 Use arrow keys to move the character through the tunnels. Help the astrunaut escae this place full of traps. Grab the green blocks, press switchs and control gravity to reach the exit. MInd the fact the ice is slippery. Use arrows to move. Enjoy this dreamy adventure and help this dude defeat the obstacles and dangerous stuff. Usea rrow keys to move and jump. Avoid pointy surfaces. If you don't find a way out, rotate the place to go somewhere else. Use arrow keys. Find the way to help the monster escape the lab full of traps and electric shocks. Use your intelligence and use special objects you'll find on the way. Use your mouse. Help this robot rescue the kitty from the monsters. Find the best techniques to jump, shoot, run and more. Use arrows to move and the rest of the controls the game will show you. Help this funny toast win this game. Don't let the enemies touch you and get all the golden bricks to win. use arrow keys. Very hard platforms game which will test your skills in every level. Try to exceed all levels. Use the arrows to move. Get all the eggs and jump over the enemies to beat them. Move with the arrow keys. This is a sick adventure where you get to do stunts and hook to the walls to win. Use the moving patforms and level up. Use arrow keys to play.